Sojourn Bicycling & Active Vacations > Travel Talk > Active Vacations > Active Vacations – You Can Do It All! Sojourn’s most well-rounded active vacations take place on the coast of Maine and in the Pacific Northwest. Both locations highlight scenic beauty and several forms of physical activity during the vacation. While both vacations are bicycling-based, each includes opportunities for hiking in, and to, spectacular off-the-beaten-path locations. Active time on the water is also a featured element, showcasing nature and geology only visible from the water. 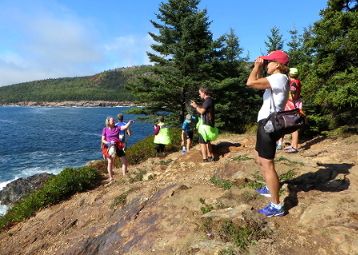 Acadia National Park, our nation’s smallest, offers perhaps the most diverse array of scenery of any of the US National Parks. Rocky and undeveloped coastline, pristine lakes, forested trails, and bald-topped mountains lie within 30,000 acres on Mount Desert Island which constitutes the bulk of the park and form a perfect backdrop for our active vacation in Maine. A network of vehicle-free carriage roads, perfect for road bikes, wind through more than 50 miles of the park. Hiking trails reward hikers with open summits offering 360º views over the surrounding islands and the sea. A sea kayak excursion in calm waters with a Registered Maine Guide offers a unique perspective on the landscape and allows for up-close encounters with seals and porpoises, and sometimes bald eagles and osprey. Top it all off with a sail on a traditional Maine Windjammer where you can help hoist the massive sails. Stunning scenery is a constant companion when you vacation with Sojourn in the Pacific Northwest. Tour the Columbia Gorge by bicycle, witnessing the world’s greatest concentration of waterfalls as you ride through lush vegetation along the Columbia River. Venture across the river into Washington for an afternoon raft trip down a Wild and Scenic River. 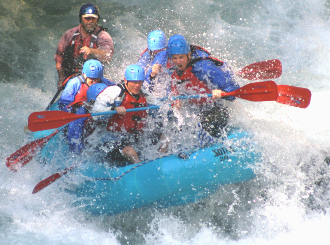 Be an active paddler (as instructed by a professional river guide) or just enjoy the ride which features sections of both flat and white water. Hiking trips offer a mix of gorgeous scenery including snow-capped peaks, old growth forest, and waterfalls – even the chance to hike behind one of the larger falls. Sections of the cycling routes are vehicle-free and have been touted as some of the best in the US by Bicycling Magazine. The region’s active lifestyle, centered on the town of Hood River, is supported by a flourishing farm-to-table network. The local beer and wine is mighty fine too! Sojourn offers a number of bicycling and active vacations throughout the US, including in Vermont, California, Arizona, Texas, North Carolina, Oregon, and Maine. Call our office today to set your active vacation plans in motion!